[Austin, Texas, USA] -When the Chronicle sat down with David Bologna to talk about his time in the original Broadway cast of Billy Elliot the Musical, the Austin song-and-dance phenom had a lot to say – more than we could squeeze into the printed interview. So here’s a fuller version. The national tour of the musical opens at Bass Concert Hall today. Bologna’s road to the Great White Way and a Tony Award nomination for Best Supporting Actor in a Musical at the age of 14 began in New Orleans and includes a stint as a championship Irish dancer, being the go-to kid in his hometown’s theatre community, his family’s move to Austin following Katrina, and months of auditions before he won the role of Billy’s best bud, the irrepressible, cross-dressing Michael. A young boy from Coventry has the world at his feet after triumphing in a national Irish dancing competition. 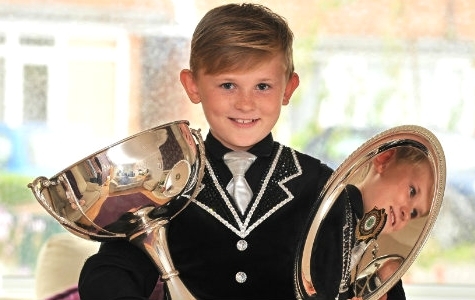 George Semple, aged 10, hopes to follow in the fast-moving footsteps of his hero Michael Flatley after winning a British National Championship Irish dancing title. It was just two years ago that the Eastern Green youngster took up the type of dance made internationally popular by the star of Riverdance and Lord of the Dance. George loves it so much he even asked for a dance studio for his 10th birthday. His wish was granted when the family’s conservatory at their Despard Road house was fitted with full-length mirrors and specialist flooring so he can practice at home. George scooped the under-11s boy’s trophy at the British National Championships in Manchester, which drew thousands of competitors from across the country. Speaking of his big win, George said: “I was shaking. Everyone was sat down waiting for the results and I was nervous. He automatically qualifies to compete for a world title at the Boston International Final in March next year. Proud mum Amanda says George’s talent has amazed dance teachers at the Turley Academy where he trains at least three times as week, as well as family and friends. The Eastern Green Junior School pupil’s passion for dancing began with weekly ballet and tap lessons when he was five. He also played rugby, but ditched the sport to concentrate on his favourite hobby. George has also inspired his younger siblings Millie, eight, and Harry, five, to take up the rapid stepped dance form. Amanda said: “He had an Irish dancing taster session at class and loved it so much he begged me and begged me to take him to Irish dancing lessons. Then he ended up at Turley Academy. “It was nothing major to start with. Then his dance teachers said he had a talent, that he could take it as far as he wanted to go. George has already amassed a hefty collection of silverware awarded for Irish dancing successes for his trophy cabinet. Roisin McCourt, dance teacher at Turley Academy, said: “George came to us two years ago having never done Irish dancing before and has done in two years what most children his age achieve in five to 10 years. A series of fundraisers are being planned to raise the cash to send George to Boston for the world championship. They are also looking for a sponsor. Villa Park, Ill. (AP) — Winning the World Irish Dancing Championship is the pinnacle of achievement for an Irish dancer, and 14-year-old Peter Dziak, of Villa Park, did that not just once but twice in a row. Peter was crowned champion in his age group earlier this month at the world championships in Belfast, Ireland. Peter squared off against 55 boys ages 14 to 15, all top dancers from Ireland, New Zealand, Australia, Germany, England, Iceland, Brazil, China, Japan and Russia. Peter achieved the same feat in 2011, when he competed against 53 kids in his age group from all over the world. 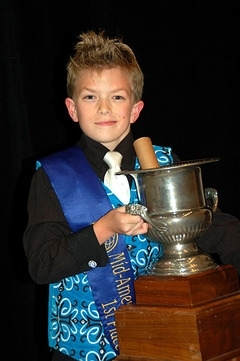 He qualified for the worlds by winning the regional competition Mid America Oireachtas in 2011 and 2010. “I don’t get nervous when I perform in public. What makes me nervous is the kids in my competition — worrying about how much they practice, how much they work. Then when I’m onstage it all goes away,” Peter said. He takes classes at Trinity Irish Dancers in Elmhurst. World Irish Dancing Championship winners are revered within the Irish dance community worldwide, said Seamus O’Se, public relations officer for The Irish Dancing Commission, which organizes the championships. “To achieve a world championship demands skills above the average, in terms of timing, rhythm, posture and general effect. The standard of Irish dancers competing at this level has escalated to great heights, and the intricacy of the steps increases year on year,” O’Se wrote via email. “The number of dancers achieving multiple world championships has always been few.” This year was an anomaly as eight solo dancers were crowned champs for the second time, not necessarily consecutively, he added. Irish dancing is a staple for the Dziak children — who also include Peter’s siblings Eileen, 21, Anne, 19, Randy, 17, Maryellen, 11, Michelle, 7, and Danny, 4 — all of whom either are taking or have taken classes at Trinity. Anne was part of a Trinity team that won worlds in 2007, and she placed 45th in her age group this year. The Irish in them comes from mom Joan, whose maiden name is Sullivan. Dad Richard is of Polish heritage and owns a landscaping company. Joan Dziak said she never Irish-danced as a kid — except for a brief, uninspired try — but her kids really embraced it. “Irish dancing has really kept our family together, from the 21-year-old to the 4-year-old. It’s beautiful music, and we really learned a lot from it,” she said. 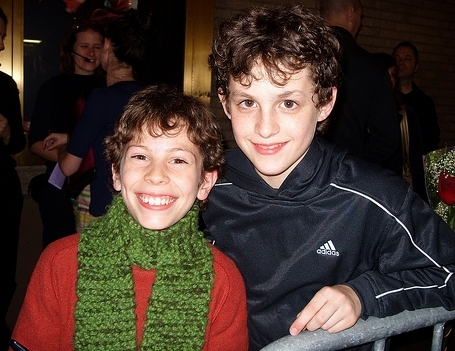 Peter joined in the fun when he was about 5 years old. Back then, Joan carted the kids to an Irish dancing school all the way in South Bend, Ind., so the kids could take lessons with their cousins. The Dziak children enrolled at Trinity in 2005, and Peter was finally able to join an all-boys’ class, which his previous school didn’t offer. “There were a lot of boys there, and other people that you could get to be friends with. With home schooling, you don’t meet a lot of people,” said Peter, who is being home-schooled by his mother, just like all his siblings. Next year he will attend Willowbrook High School as a freshman. One of the best parts of being a Trinity dancer is getting to perform onstage at different shows in theaters, parades, nursing homes, Peter said. He even danced at halftime at a Bulls game. This summer, he hopes to go on his first tour abroad to Belgium. 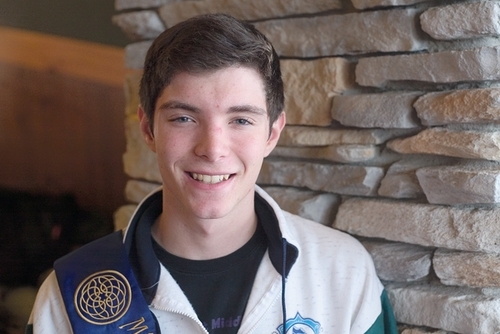 “I like Irish dancing because it’s a way to learn a good work ethic,” Peter said. “Mostly it’s just hard work, dedication to it. To me it comes easier because I have natural talent. My feet are naturally turned out. People would have to think about that, but I don’t have to think about that. I can think about other things like keeping my toes pointed, or keeping my lines in,” he said. He practices two to three times a week in class, and at home on a wooden stage built in the backyard. Dance is not a single-minded pursuit for Peter. He plays on a baseball team (Villa Park Vipers), swim team (Villa Park Mariners) and soccer team (through the Amateur Youth Soccer Association in Elmhurst). He also helps his older brother Randy with a small landscaping business, working on neighbors’ lawns in the summer and shoveling snow in the winter. The money he earns helps out with costumes and travel expenses for his Irish dancing, Peter said. Mark Howard, founder and artistic director of Trinity, said Peter definitely could have a future as an Irish dance teacher, or possibly as a dancer with a commercial show like Flatley’s. Irish dancing, however, is not exactly a professional career, he said. Trinity, which has 13 locations in the Chicago, Milwaukee and Madison areas, has won more than a dozen team dancing world championships in its 30-year history, but Peter was the first to earn a solo title, Howard said. Peter has natural talent but has put in a lot of hard work to become a smooth, seemingly effortless dancer, said Trinity’s Whitney Rondeau, who teaches Peter along with instructors Natalie Howard and Laura MacNamara. “He seems to enjoy what he’s doing. It doesn’t look like it takes a lot of effort. I think that’s part of his talent,” Rondeau said. “He’ll watch you do a tricky piece once or twice, and he can mimic it. It might not be the cleanest, but he definitely can pick it up. He’s really good at picking up difficult rhythms,” she said. For the third year in a row, local dancer McKimmon Engelhardt is a good bet to win at the Mid American Irish Dance Championship, set for Nov. 25-27 held at the Hyatt Regency O’Hare. McKimmon dances with the McNulty Dance School headed by Barbara McNulty. At 12, McKimmon, also known as “Mack,” is a versatile athlete who participates in football as well as traditional Irish dance. The Sugar Grove resident attends Holy Angels School in Aurora. McKimmon does both solo and team competition, and values each equally. “With teaming, I get to work cooperatively, with a team. With solo dancing I get to use all of the different techniques,” he said. Spurred on by an older sister who danced ballet and wanted to do something more athletic, McKimmon was asked what dance meant to him. 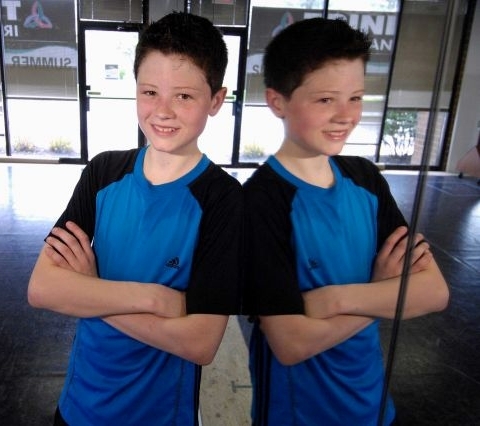 According to his dance teacher Barbara McNulty of the McNulty School of Irish Dance, “McKimmon is a very hard worker. He takes criticism very well. He will listen to you and go back and practice, work on what doesn’t work,” said his teacher, Barbara McNulty. McNulty stresses the connection between early traditional Irish dancing such as the Irish jig and reel and the more modern, athletic forms of Irish dance as exemplified by dancers such as Guy Flatley in his “Lord of the Dance’ film and performances. Usually, McKimmon does the team dance referred to as “Ceili.” American square dancing has its roots in Irish Ceili dancing. This kind of dance emphasizes height and extension, with the dancers on point. This is mixed team dancing, with two boys and six girls. McKimmon started out winning regional championships and has participated in three National Championships, taking second place this year. In 2010 he placed 12th in the World Championships, held in Scotland. This year, he won a sixth place in competition in Ireland. “You get nervous before a big championship — all of the buildup. The dance itself is a bit of a release. You can relax. It’s off your shoulders. You can talk to your friends about it,” he said. When asked how he would incorporate traditional Irish dance into his future plans, McKimmon didn’t even pause for a breath. His own adventures in Irish dance began six years ago when he was a kindergartener, and a milepost was reached late last month when Schwartz took home the gold at the Mid-America Irish Dance Championships in Chicago. By finishing at the head of a field of 16 competitors, Schwartz, who studies at Chicago’s Trinity Academy of Irish Dance, qualified to represent the U.S. in April’s 2011 World Irish Dance Championships in Dublin, Ireland. His lessons began in the American Legion Hall on Milwaukee Avenue with the Anam Mor Irish Dance School, and he moved on to Trinity to focus on the all-boys classes offered there. “They play a lot of soccer and run around — and, oh, by the way, they dance,” his mom said with a laugh. The lessons are now a two- to three-day commitment each week, driving to Trinity facilities in Western Springs and in the Irish American Heritage Center on Chicago’s North Side. Ian also takes team-choreography lessons closer to home at Oak Grove School in Lake Bluff. The hard work culminated with the Mid-America championships on Thanksgiving weekend. Ian’s mother said her son had a special motivation for the event — Tyler recently suffered a broken pelvis during a dance competition. When Evan Lowe was 3 years old, his mom, Patti Spencer, took him to the Irish Fair at Harriet Island. She wanted to see the Irish dancers. He didn’t. Evan lost the argument, and 11 years later he’s glad he did. “We went in and then they couldn’t get me to leave,” said Lowe. When he’s not dancing he likes to watch others. He rented the Lord of the Dance videos so often that eventually the store gave the video to him. The obsession is starting to pay off. Over the weekend of Nov. 26-28, Lowe competed in the Mid American Oireachtas. The competition draws the best Irish dancers from throughout the region, and as Lowe found out, in the world. Despite the fierce competition Lowe, who competed in the 14-and-under category, won and qualified for the 2011 World Irish Dance Competition in Dublin, to be held in April. He also qualified for the national championship in Nashville, which will be held in June. “I sort of came out of nowhere,” said Lowe of his win at the Mid-American Oireachtas. While he’s danced for years, Lowe only recently started competing. To qualify for worlds having only taken part in a few competitions is remarkable, said Spencer. “I think he surprised a lot of people,” she said. A former student of the St. Paul Irish Dancers, Lowe decided to switch so he could dance competitively. The school, which is led by Cormac O’Se, is one of the best in the region and frequently sends dancers to national and world competitions. O’Se is an experienced dancer who has worked in productions including Riverdance. 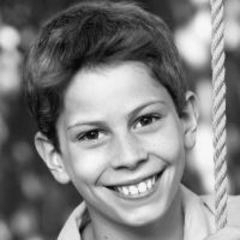 Lowe will spend the next few months practicing in preparation for the competition. He also will do some fundraising to help him with expenses for his trip to Dublin. Lowe hopes going to worlds is just the beginning of his dance career. He has set goals to dance for either the Trinity Irish Dance Company or for a major show such as Riverdance or Lord of the Dance. Trinity Irish Dance is one of most revered Irish dance companies in the world. Outside of dance, though, he’s just a regular high school freshman. He likes to hang out with his friends and loves old rock and roll. “I like to find what legal shenanigans I can get into,” said Lowe.